Montreal's Pouzza Fest is set to take over the city once more this May, and organizers have lifted the curtain on the lineup for the 2018 event. 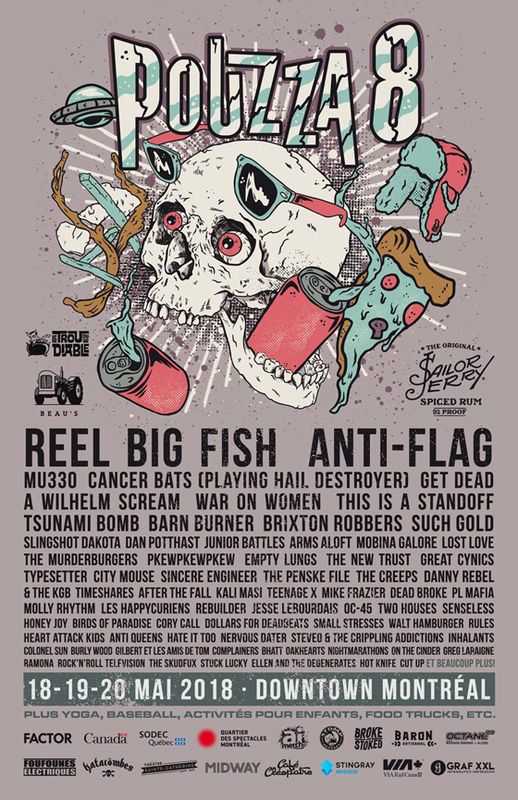 Reel Big Fish and Anti-Flag top this year's bill, joined by MU330, Cancer Bats (playing Hail Destroyer in its entirety), Get Dead, A Wilhelm Scream, War on Women, This Is a Standoff, Tsunami Bomb, Barn Burner, Brixton Robbers, Such Gold, Slingshot Dakota, Dan Potthast, Junior Battles, Pkew Pkew Pkew, the Penske File and many more. You can find the full performer poster pictured above, or head over here for further background on all of the acts set to play. The eighth edition of Pouzza Fest will take place from May 18 to 20 in various venues around downtown Montreal. Three-day festival passes are currently on sale for the Early Bird price of $76.67. Further festival and ticketing information can be found through the official Pouzza Fest website.